Phil Hughes pitching against the Toronto Blue Jays. Phil Hughes, who was one of the most highly rated and one of most anticipated prospects in the Yankees’ minor league system before being called up in 2007, is now a Minnesota Twin after signing a three-year, $24 million contract with the small market team. He should see more success with Target Field as his home park and pitching in the American League Central as he had 3.88 ERA in away games last season. His overall ERA was 5.19, and his ERA at Yankee Stadium was 6.32, which is the main reason that the Yankees did not offer him a qualifying offer. Phil Hughes had a 4.54 ERA in 780.2 innings with the Yankees. That is the third highest ERA in team history among the 88 pitchers to throw at least 500 innings for the Bronx Bombers. The Minneapolis Star Tribune said that the deal is expected to be announced this week. A physical is now the only thing that is preventing the deal from being official. Another stat that will help Hughes’s transition to Minnesota will be his 1.89 ERA in 71 1/3 innings against the Chicago White Sox and Cleveland Indians, who are in the AL Central. He showed some potential to be a number two or three starter earlier in his career, which is what the Twins are expecting him to duplicate away from the pressure cooker that surrounds the Bronx. As recently as the 2012 season, Hughes picked up 16 wins and had a decent 4.23 ERA in 191.1 innings. However, his best season as a starter came in 2010, where he was 18-8 as a 24-year-old, and had a 4.19 ERA in 176.1 innings. He was an All-Star that season after pitching much better in the first few months than after the All-Star break. It is unfortunate that Hughes did not pitch a little better last season, since he was 4-14 and the Yankees missed the playoffs by 6.5 games. If he would have pitched a little closer to how he did in 2012 they might have made the playoffs or finished a game or two out of the Wild Card. If that would have happened they could have offered the qualifying offer and received a high draft pick in return. He likely would have declined the qualifying offer in this scenario. Given his 3.88 ERA in away games there is a definite possibility that Hughes could become an All-Star again for the Twins. A.J. Burnett, who was a starter for the Yankees from 2009-2011, had an ERA of 5.15 for the Yankees in 2011, but the next season for the Pittsburgh Pirates he ERA was a very respectable 3.51. Hughes, who is nine years younger than Burnett, could follow a similar path as that of the former post-game pie thrower. In other Yankees news, Brendan Ryan has been officially brought back to the team as a back-up shortstop. He received a two-year, $5 million contract with a club and player option for a third year. With incentives, this contract could be worth $10 million. It is surprising that he was not given a one-year deal based on his very limited hitting ability. He only has a .217 average over his last four years. However, he is one of the best defensive shortstops in baseball and can be counted on to prevent runs defensively and be a suitable fill-in for Derek Jeter. This contract signifies that the Yankees organization does not have much confidence in Eduardo Nunez. He had the opportunity to be the starting shortstop last season, as a result of Derek Jeter’s injury, but he was placed on the disabled list on May 12 because of soreness in his left rib cage. He also was rated highly as a minor leaguer, but has had a history of making too many errors and making plays that prove that he has a sub-par baseball IQ. Back when George Steinbrenner was still alive the Yankees might have overpaid for C.J. Wilson of the Texas Rangers or the 25-year-old Japanese hurler Yu Darvish, but it seems like the current regime will stick with the current rotation, or add a minor addition to the pitching staff (or a lefty in the bullpen). 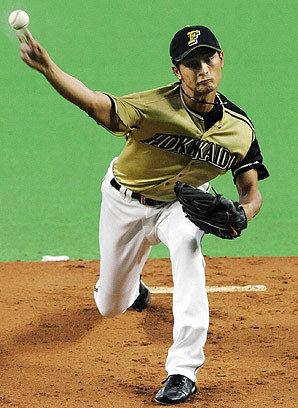 Darvish (who is half Iranian and half Japanese) is an intriguing option based on the seven pitches that he can throw as well as being the best pitcher currently in the baseball crazed country of Japan, but it has been reported that he will likely demand a posting fee before signing his contract like Japanese players typically do when leaving their contract early. (The Red Sox paid a 51 million dollar posting fee for Daisuke Matsuzaka.) The Yankees last pitching acquisition from Japan, Kei Igawa, did not work on any level, so they will not want a repeat performance. I realize that Darvish, has had better overall stats during his professional career in Japan, but there is no guarantee that he will be able to handle the constant scrutiny in New York City the way Hideki “Godzilla” Matsui did. Wilson, the 31-year-old pitcher with a media friendly personality from Newport Beach, California, is a pitcher who has been rumored to want to play for the Yankees. He is coming of his best season of his career after finishing with 16 wins, a 2.94 ERA, 206 strikeouts and 223.1 innings. Wilson finished sixth in the American League in the CY Young voting, but a knock against him is that half of his division games in the AL West were against the weak offenses of the Oakland Athletics and the Seattle Mariners. Wilson, or @str8edgeracer as he is known on Twitter, was the Rangers number one starter last season, but would likely be the number two or three on the Yankees. It is also not the most promising sign that his best season came when he was 30. If Ivan Nova and Phil Hughes pitch up to their ability then Wilson would not be much of an upgrade. As far as Darvish, he would be asking for the contract equal to a number one starter and the Yankees already have CC Sebathia. 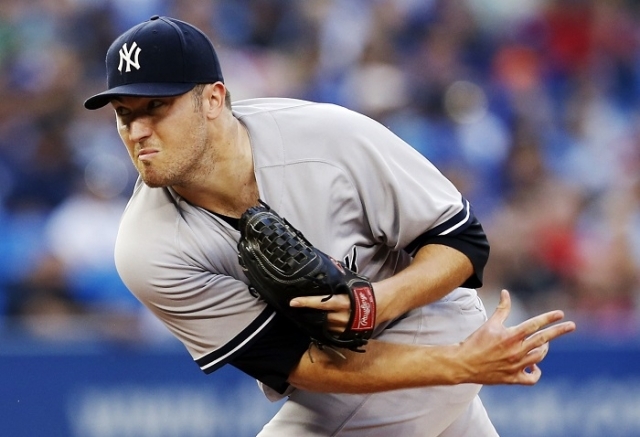 Other free-agent pitchers who the Yankees could be interested in bringing to the Big Apple are pitcher Roy Oswalt (Phillies), Edwin Jackson (White Sox) and Mark Buerhle (White Sox). They are all either old, have some question marks or both. If this would have been the 2010 off-season I would have wanted to sign Buerhle as a lefty replacement for Andy Pettitte, but at 32 I am not sure he can handle pitching in the AL East and New York City. I would sign up for Buerhle, replacing a likely member the 2012 Yankees rotation, A.J. Burnett, as the number four starter, but I will state later on why that likely will not happen. He has pitched for the White Sox his whole career and has always been reliable and durable, but one has to wonder how many more productive seasons he has left. 1. CC Sebathia – He is everything you can want an ace pitcher to be. He is coming off as season where he picked up 19 wins, had a 3.00 ERA, 230 strikeouts and only allowed 61 walks in 237.1 innings. Since the 2005 season concluded, he has only had one season where his ERA was above 3.22 and he has also had 17 wins or more every season since the 2006 season ended. Sebathia can be counted on to go deep into games, stay healthy and always give the Yankees a chance to win. He likes pitching under pressure and since he has so many reliable pitches he can be counted on to get out of trouble. 2. Ivan Nova – Last season the 24-year old righty who was in his first full season in the majors emerged as a viable top of the rotation starter. Nova had a rocky last start of the season where he allowed four runs, but in eight of his last 10 starts of his season he allowed three runs or less. This proves that he did not hit the “rookie wall” or get worse as the pressure increased like many young pitchers do. His 2011 season was filled with positives including his 16 wins, 3.70 ERA, 165.1 innings as well often not letting a one run inning turn into three or four. The only area for him to improve are the number of free passes that he allows. Last season he walked 57 batters, which is more than half of his strikeouts, but I see him cutting down on that number as well as lowering his ERA to below 3.50. Another positive attribute is that he often limited walks from scoring. 3. Phil Hughes – I see him being able to bounce back to sometimes dominating pitching that he displayed during the 2010 campaign, where he made the All-Star team. He was awful during his first three starts of the season after which he was put on the disabled list until July, but he did end the season on a positive note. He had three starts in August where he allowed two runs or less (August also included two starts where he surrendered six runs) and he combined for three runs in his last two starts before being sent to the bullpen. If he can finish 2012 with 14 or 15 wins and a 3.60 ERA that would be a success. 4. Freddy “The Chief” Garcia – I was not sure what to expect when Brian Cashman signed Garcia before Spring Training to a one million dollar contract. He was 34 and was coming off a season where he had a 4.64 ERA for the White Sox. However, he did indeed surpass my expectations. His 3.62 ERA was his best full season ERA since he was third in CY Young voting in 2001, while his 12 wins and ability to change speeds on his pitches was also impressive. If he can duplicate his stats from 2011 he deserves to have this spot but I am not sure he will get over the enigmatic pitcher I have in the number five spot. 5. A.J. Burnett – Before the 2009 season he signed a five-year, 82.5 million dollar contract with the Yankees. He was coming off a solid, but far from stellar, season for the Blue Jays, where he had 18 wins, a 4.07 ERA, an impressive 231 strikeouts but also 211 hits. Burnett has not lived up to his contract during his three years on the team. Last season he had 11 wins, a 5.15 ERA, 1.43 WHIP and 190 hits. Those stats don’t warrant anything higher than a number five spot in the rotation. I would prefer a free agent signing such as 29-year-old Paul Maholm from the Pirates or the 32-year-old Erik Bedard, who is productive when healthy, but that is not very likely because Brian Cashman likes Burnett and does not want to give up on that contract. Burnett’s tenure with the Yankees has been filled with inconsistency, but he does have potential. He only allowed one run during his start against Detroit in the playoffs. *** A dark-horse to look out for is 20-year-old Manny Banuelos. If A.J. Burnett is inconsistent until the All-Star break and Banuelos cuts down on his walk rate there is a strong possibility that the best arm in the Yankees minor league system could join the rotation. All of the starters were bragging about him in Spring Training last season and he has a very effective curveball/fastball combination. He has received praise from the future Hall of Fame closer, Mariano Rivera, who said that he was the best pitching prospect he had seen. This strategy of not overspending for a potentially questionable starter (that is not to say that they don’t have talent) makes sense because Felix Hernandez, who won the CY Young in 2010, and is arguably the most talented pitcher in the American League will be a free agent after the 2014 season. At that point, CC Sabathia, will probably only have about two or three productive years left. A.J. Burnett was magically able to live up to his potential, only allowing one run in 5.2 innings, helping the Yankees win 10-1 and force a deciding game five, in the Bronx, on Thursday. After being one of the most least likely and counted on pitchers to start a potential series deciding game Burnett was able to come out and pitch like he did in 2009. In his first season with the Yankees, after signing a $82.5 million contract, he had 13 wins, with a 4.04 ERA and 195 strikeouts. During the American League Division Series that season, against the Twins, he allowed one run, in six innings, while striking out six. This start was very similar as he struck out three, while walking four, in his 5.2 innings. Joe Girardi could have even left him in to finish the sixth, but with Burnett it is better to be safe than sorry. Hopefully, if the Yankees go onto win the game on Thursday as they should, Burnett will pitch well in the ensuing rounds unlike the 2009 ALCS and World Series. It did not come back to hurt the teams since the won the championship in 09, as a result of their superior pitching staff, but this year they will need a another solid start out of him. The Yankees played a dominating all around game as the defense, bullpen and offense all did their part. In the third inning, shortly after Curtis Granderson’s remarkable defensive display began, Derek Jeter would continue to excel in the postseason like normal, as he gave the Yankees all the runs they would need with his double to center that scored Jorge Posada and Russell Martin. MVP candidate, Curtis Granderson, was by far the star on defense as he made two catches in center-field that could both be number one on the Sportscenter Top 10 plays list. His first gold glove worthy catch was when the bases were loaded in the first inning and Don Kelly hit a deep fly ball near the warning track with two outs. Granderson timed his jump perfectly to prevent any runs from scoring. This completely changed the game because the Tigers could have easily scored three runs on that play. Granderson did his part at the plate, as well, since in the fifth inning he smacked a double to right that scored Brett Gardner. Gardner, after struggling a little in September, has been a major bright spot for the Yankees in the playoffs with his .385 average. His second stellar catch was not as important to the outcome of the game but was almost more impressive. Johnny Paralta was Rafael Soriano’s first batter and it appeared that Soriano would be on his way to blowing the 4-1 lead. This time there was only one runner on base but Granderson went all out in order to fully extend himself on his head first dive to just barely catch the ball. It was somewhat surprising that Soriano came into the game, after he gave up the homer that won the game for the Tigers in game 3, so he definitely owes Granderson after that catch. The outcome of the game was still in doubt after that catch because the Yankees were only winning by three, after six innings where Morristown, New Jersey’s, Rick Porcello, allowed four runs, but the eighth inning would be where the Yankees would live up to their Bronx Bombers nickname. They scored six runs in the eighth inning off of a combination of former Yankee, Phil Coke, Al Alburquerque and Daniel Schlereth. They would load the bases off of Coke and a key to this inning was that after struggling earlier in the series, Mark Teixiera and Alex Rodriguez were finally productive. They amazingly scored all of their runs in this inning off of a wild pitch, a balk, and singles by Jesus Montero (in his first postseason at-bat), Brett Gardner and Robinson Cano. In total, the Yankees batted around that inning and Rodriguez and Teixiera batted twice. Rodriguez was 2-4 with that RBI and he will need to continue his productive play in game 5. Teixiera and Rodriguez are supposed to be two of the anchors of the offense but the Yankees were able to win with only one RBI from those two because of an all around team effort. The bullpen, including Soriano, got the job done like they have so many time this season. Soriano, combined with Phil Hughes and Boone Logan, pitched 3.1 innings while not allowing a hit or a walk. That is all you can ask for and it was an added bonus to keep Mariano Rivera and David Robertson rested for game 5 on Thursday. It will be rematch of the continued game 2 as Ivan Nova will match-up against Doug Fister on Thursday. Nova, who should be the Rookie of the Year will be up to the task since he has pitched well in every big game he has started this year. He is confident but not cocky so he should be able to handle the pressure that he will find himself in when he makes the start at Yankee Stadium. A.J. Burnett has definitely earned himself another start, so hopefully Nova and the offense will be able to lead the team to the ALCS against the Texas Rangers. This was their fourth rain delay this season against the Orioles who came out on top 5-4 in extra innings over the Yankees in a game that featured six errors and 13 relievers. Baltimore and New York’s starters each struggled giving up a combined eight runs. Zach Britton who had been one of the Orioles better starters of late gave up all of the Yankees runs on five hits and four walks. A.J. Burnett did not really do enough to deserve another start in this six-man rotation that should turn into the standard five-man one. He allowed four runs on seven hits, with four walks and a homer. This start proved again how unreliable he is since he allowed two runs in his start last week against the Red Sox but in his two starts before that one he allowed a combined 16 runs. Burnett gave up a two run homer to Nolan Reimold, his ninth of the season, who is only hitting .231. It is truly hard to fathom how Burnett gave up two runs by the Boston offense but could not limit the paltry Baltimore offense. It seems like Hughes can be counted on to pitch more consistently than Burnett especially since he only has one win in his last 10 starts while Hughes has shown some dominance since coming off the disabled list. The offensive stars for the Yankees were Jesus Montero and Alex Rodriguez as they drove in all of their four runs. Rodriguez had a two-run double to deep center which drove in Russell Martin and Nick Swisher in the opening stanza, and Montero (5 RBI in 5 games) singled to deep right center which plated Rodriguez and Andruw Jones. In the bottom of the sixth shortstop Robert Andino fielded a shot hop cleanly and it appeared that he would throw out Jesus Montero but Andino would receive an error because his throw to first sailed into the Yankee dugout. In an effort to get the lead before the game was potentially called because of rain Manager Joe Girardi sent in Robinson Cano and Mark Teixiera. Curtis Granderson was inserted into the lineup after Teixiera which would make a very imposing seven, eight and nine to round out the order. Granderson hit a double to the wall in the seventh which had the potential of being a triple but he tripped after rounding first base. However, his double to lead off the inning would go to waste as he would be stranded at third keeping the score at four. The Yankees squandered an opportunity to put the game away in that inning. In the top of the eighth David Robertson dominated like normal but this time he struck out the side. He used his cutter to perfection. In the ninth inning Clay Rapada would pitch for the Orioles and he is very deceptive on left handed pitchers because he is a side arm pitcher. The umpire went to the mound to try and force Rapada to put his foot on the rubber but it appeared as if his foot stayed off the rubber for the rest of the at-bat against Cano. Rapada would get Granderson to fly out to the catcher and with that Buck Showalter would make yet another pitching change. Pedro Strop would come into the game becoming the Orioles seventh pitcher on the afternoon. Strop, a converted shortstop, has a 3.09 ERA in 10 appearances, two for the Orioles and eight for the Rangers. He would get Eduardo Nunez to ground out to Andino at short to force extra innings in a game filled with errors. To start the “free baseball” Hector Noesi struck out Chris Davis to give him five on the afternoon, as well as a grand total of 20 in his last 40 at bats. Noesi would go on to strike out the side as he has filled his role adequately in relief this season. Russell Martin picked up his second hit of the contest to lead-off the bottom of the 10th, but the next three batters would get out in order. Martin was the only Yankee who played the whole game to come away with two hits and he also had his second consecutive game with multiple hits. After pinch hitting for Ramiro Pena, Granderson got a hit in two out of his three at bats. Nunez came away with an error after failing to pick up the fast short hop by Matt Angle. That was the fourth error of the game and committing so many miscues makes it difficult to win games, but the wet conditions certainly don’t help. Joe Girardi left Noesi in one inning too long as he threw a wild pitch to Reimold and the feast or famine Mark Reynolds hit an RBI single. Eduardo Nunez had the chance to be the hero in the bottom of the eleventh and make up for committing his 18th error, but Girardi decided to replace him with Eric Chavez with runners on first and third. This strategic move proved to be an instance of over-analyzing because Chavez would ground into a fielder’s chance to end the game. The Yankees offense should not have been held scoreless for six innings off of an Orioles bullpen that features the previously mentioned converted shortstop, a reliever making his fourth career appearance in Zach Phillips and four who all have more than a 4.15 ERA. A reason for only scoring four runs in 11 innings is that they did horribly in clutch situations once again. Four players including Swisher, Cano, Montero and Chavez left runners on base with two outs and overall the team left nine runners on base. It is very important to drive runners in with ducks on the pond and in this game the Yankees could not convert off of mediocre pitchers. It also would have helped if Martin would have thrown out some of the base stealers as three of the five stolen bases off of him came around to score. If he would have thrown out two or even three of them that might have caused a different outcome. The Yankees will try and win the series (3-1) tonight behind Ivan Nova who strong candidate for Rookie of the Year. He has now gone eight consecutive starts with a win and has not picked up a loss since June 3rd helping him to a remarkable 15-4 record. Nova does not crumble under pressure and he has even improved his pitch location and execution after allowing one or two early runs. They are 8-2 in their last 10 games helping them stay 2.5 games ahead of Boston. Yankees hope to have more fans today after winning a game that ended at 2:05 a.m.
After a 4 hour and 3 minute rain delay, and about 1,000 brave souls in the stands, Phil Hughes was finally able to throw the first pitch in a game that the Yankees would not win until 2:15 a.m.
For the second run of the game, Francisco Cervelli hit a long fly ball just in front of the warning track and it appeared that the left-fielder what make the catch. However, as a result of all the wind and rain, the ball went in and out of Matt Angle’s glove, so he advanced to second and Jorge Posada scored. Posada had earlier hit a solo homer so he had scored both of the runs through five innings. The error by Angle would be the first of three Orioles’ miscues during the game but only one error would lead to an unearned run. Hughes cruised through the first five innings, keeping the Orioles off the scoreboard while only allowing three hits. This proves that he was able to locate his pitches well but it was not all that promising that he had thrown 91 pitches to that point. In the top of the sixth, the second to last batter Hughes would face was Matt Wieters and he would hit a long home run to deep right that scored the possible Hall of Famer Vladimir Guerrero. Hughes rebounded well, especially considering the conditions he was pitching in, after allowing 12 runs combined in his last two starts. The Yankees would score all of their runs off of Orioles starter Tommy Hunter. He was acquired by the Orioles in a July 30th, pre deadline deal which would send Hunter and Chris Davis to the Orioles and Koji Uehara to the Texas Rangers. In the bottom of the sixth inning Mark Teixiera singled to right for his 102nd RBI, which scored Derek Jeter after he had singled earlier in the inning. Finally, in the bottom of the seventh inning the usually light hitting duo of Cervelli and Brett Gardner would hit back-to-back homers to give the Yankees a 5-3 lead, and close out the scoring. Cervelli hit only his fifth home run and fourth this season, during his 180 game career with the Yankees as the back-up catcher. However, this was a disputed home run that can be compared the Jeffrey Maier incident back in the first-round of 1996 playoffs since that was against the Orioles as well. This play can not exactly be compared with the famous play in 96 that helped the Yankees win the playoff game because Angle was not planted under the ball like Tony Tarasco was on Jeter’s homer. There were much less than 1,000 drenched fans at the stadium at this point, and the ball just so happened to touch the hands of two people as they were reaching over the left-field wall. Corey Wade would get his second win in his last four appearances out of the bullpen, once again proving to be a gem of a signing by General Manager Brian Cashman since he only has a 2.05 ERA, and nobody really made a big deal when he was acquired. Mariano Rivera would lock-down his 39th save of the season in order, and is now only four saves away from overtaking Trevor Hoffman as the all-time leader. The Yankees brain-trust executed yet another admirable gesture by saying that anyone who had bought a ticket to the game, but decided not to attend because of the adverse conditions, can exchange this ticket for any 2012 game. Both teams have a very fast turnaround as last night/this morning’s game ended only about 10 hours and 45 minutes before today’s game is scheduled to start. It does not really make sense that they played the game last night, since there was such an increased chance for injury, but the Yankees got the win to keep them 2.5 games ahead of the Red Sox, which is the bottom line. Joe Girardi is sending out what looks like a Spring Training lineup on first glance, but when one looks at it more closely it makes sense to give many starters a day of rest after the marathon like game last night. There is also only one more off day before the playoffs begin. Derek Jeter, Robinson Cano, Curtis Granderson, Mark Teixiera and Brett Gardner will all be getting the game off. Their replacements will be Eduardo Nunez, Ramiro Pena, Greg Golson, Brandon Laird and Andruw Jones. A.J. Burnett will get the start for the Yankees and it will be interesting to see if he will be able to defeat the elements after having a much needed respectable start against the Red Sox on Thursday where he allowed two runs in 5.1 innings. Girardi said two days ago that he will keep Hughes and Burnett in the rotation for at least on more turn so we will see how Burnett performs against a much less imposing lineup. If Burnett allows three runs or less then that will make Girardi’s decision interesting but if the allows more than three then Hughes should remain in the rotation because Burnett is too much of a question mark. Zach Britton will take the hill for the Orioles and he held the Yankees offense scoreless during seven innings 10 days ago. Britton has likely been O’s most reliable starter of late only allowing three runs in his last three starts. In his career against the Yankees, which only includes three stars he has a 3.77 ERA, but this season on the road his ERA sits at 6.32, which is nothing to write home about. It seems like the elements will play a role in the game once again because it has been raining off and on all morning. Nobody knows how much the rain will affect Burnett but it is possible that he will be able to limit the Orioles like he did against the Red Sox since their offense is much less potent. There were many positives during this game, however, the one that stands out is that A.J. Burnett actually pitched the Yankees to victory, only allowing two runs. I still think he should be taken out of the rotation, as he allowed 16 runs in two starts before this one, and his ERA is still 5.25, but now Girardi at least as a legitimate decision to make after Phil Hughes struggled so much in his last start. Not many had confidence in Burnett coming into this game, but something was able to click in his brain allowing him to pitch like he was still a member of the Toronto Blue Jays. What he was a starter for the Blue Jays he was consistently effective (2.56 ERA in eight starts) instead of consistently ineffective in eight starts before this one for the Yankees (8.71 ERA and zero wins). Jon Lester had struggled in his three previous starts against the Yankees this season, but he will likely be somewhere in the top 10 in the CY Young with his 3.09 ERA, so it is not surprising that he only gave up one run in five innings. Lester likely would have been able to pitch deeper into the contest if it was not for his very eventful top of the first. David Ortiz hit a hard single to right, in the second inning, which gave him a 15 game hitting streak. In the top of the third Andruw Jones missed a double by inches as his towering line drive just missed hitting the foul line on the Green Monster. However, unfortunately he would go on to strike out looking on a 2-2 count. Jones would go 0-1 with three walks but more importantly he has hit more like the hitter he was with the Braves for much of the second half of the season because of an advice from a somewhat unlikely source. Jones would receive a call during the All-Star break from his mother who said that she didn’t like the way he was setting his legs in his batting stance. Amazingly, during what was Burnett’s best start since June 29th, he only gave up Dustin Pedroia’s two run blast in the bottom of the fourth. This would score MVP candidate Adrian Gonzalez, and would prove that Burnett is actually capable of adjusting to adversity. With one out in the fifth inning Robinson Cano hit a long double into the triangle in center-field on Lester’s 100th pitch. That double was Cano’s 39th of the season. Swisher bunted with one out which is very puzzling because he is one of the better RBI men on the team. They were down by a run and he could have driven in Cano with a single. Jesus Montero would bat in top of the fifth with a chance to be the savior, but the nerves of playing in his first big league game and facing Lester got to him as he grounded out to shortstop. Mark Teixiera got hit right on the knee to load the bases after Derek Jeter singled off of the Green Monster and Curtis Granderson walked. At least that was not a fastball or he would have been badly hurt. However, the Yankees failed again with men on base as Cano grounded out to third. In the sixth inning, with david Ortiz batting, Burnett threw a pitch with a 3-2 count that appeared to be strike three on the outside corner but the umpire called it a ball. Joe Girardi made the correct decision taking him out of the game at that point. Burnett had allowed a single to Pedroia before that walk, and it was smart not to take any risks with AJ pitching. To end the sixth inning Curtis Granderson made an outstanding diving catch to prevent two runs from scoring. This also kept Burnett’s line at two runs, which is impressive. One of the Yankees best prospects, Jesus Montero, who is known for his hitting, left a total of six runners on base in his first three at bats. He would not do any damage in his fourth at bat but at least he was able to get himself to first via getting hit on his jersey. With runners on first and second, Russell Martin decided to come through in the clutch, after so many had not earlier in the game. Chris Dickerson, who had pinch run and Montero, scored giving the Yankees a 3-2 lead. Eric Chavez would hit a single to send Martin home, while would set the Yankees up for victory as their dominating bullpen options were on deck. In the bottom of the ninth, Mariano Rivera surprisingly walked two hitters and give up a single before Adrian Gonzalez came to the plate. He just wanted to make the game bottom of the ninth interesting as Gonzalez would be called out on a checked swing to give the Yankees the victory and with the win they are now tied in the loss column with Boston. The Yankees stranded nine base runners in the first five innings which would be a theme that luckily did not cost them the win. They would go on to leave 13 men on base and would leave runners in scoring position with two outs six times, with Montero being the culprit three times in his debut. On the other hand, Boston would be equally hurt by leaving 10 runners on base. Another major reason that the Yankees got the upper hand in this game was that their bullpen vastly outperformed the Red Sox’ relievers. Former Yankee pitcher Alfred Aceves, who can do a little of everything (and who choose number 91 after Dennis Rodman) gave up Martin’s double and in the process surrendering his teams lead. Daniel Bard would allow the Yankees to have a two-run cushion as the Yankees best three relievers were set to enter the game. Eric Chavez would close out the scoring off of Daniel Bard, with an RBI single, and he has improved his average 21 points since August 28 (this drastic increase is partly because he is a part-time player). However, for the Yankees, their relievers only gave up one hit in 3.2 innings. Corey Wade (2.17), who would get the team out of the fifth inning and pick up the win, was signed on June 13th and has proven to be one of the better mid-season, under the radar, acquisitions by GM Brian Cashman. The impressive back of the bullpen trio of Rafael Soriano, David Robertson and Mariano Rivera imposed their will like normal, but they just had to work around four walks between them. Rivera got Gonzalez out on his patented cutter which has to be one of the best single pitches of all-time. The best closer in baseball history will soon be official as he is now five saves away from 600 and seven away from Trevor Hoffman’s all-time saves record. He could accomplish this feat in late September. They now begin six game home-stand against division foes Toronto and Baltimore (with one on the road because of Hurricane Irene) who are in fourth and fifth place, respectively. Boston will now face Texas and Toronto in their next six games as the neck-and-neck division race is bound to continue until the last few days of September.